A mysterious WhatsApp message is causing smartphones to crash. We found out the reason behind it. A mysterious message is making Android and iOS devices crash. When tapped, the message is making the WhatsApp crash along with the entire device. The message which includes a black dot is causing the mayhem. The message itself is self-explanatory. 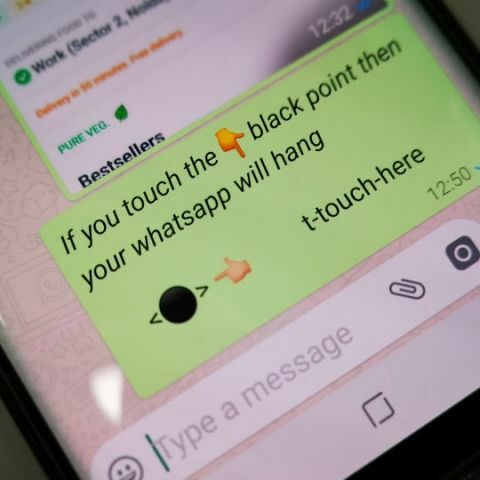 It says “If you touch the black point then your WhatsApp will hang.” We independently investigated and can confirm the message indeed crashes the app, although relaunching the app seemed to fix it. According to Slashgear, it’s a typical message bomb that’s causing the crash. Message bombs are specially crafted message with hidden symbols in between spaces. When you tap a portion of the text, the app will make the message ‘expand’ to show the hidden symbols that overloads the app and sometimes, even the OS. The publication reported two such messages are doing the rounds. Both includes these special characters that are invisible but are used to change the behaviour of the texts. There are 6000 invisible unicode characters alternating between ’200E’ and ’200F’. The two characters are usually used to indicate left-to-right and right-to-left writing. The creator of the bug put an even number of the character that did not change the direction of the text, but WhatsApp couldn’t process that many direction changes as they are all loaded into memory which has a physical limit. It seems, however, only WhatsApp is crashing while trying to read the message. Facebook Messenger is reportedly blocking the message. Interesting nonetheless, it’s one of the less alarming news to come from WhatsApp recently. Last week, WhatsApp CEO resigned after a disagreement over privacy policies while earlier, co-founder Brian Acton who had left the company last year tweeted it’s time to delete Facebook in the aftermath of the Cambridge Analytica scandal.